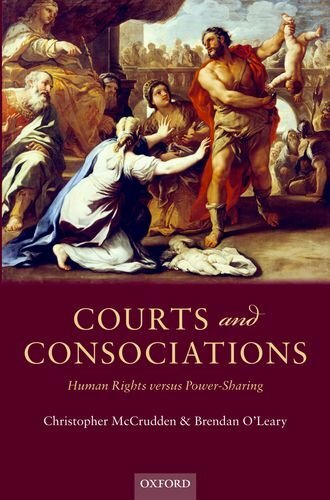 This May, Oxford University Press will publish Courts and Consociations: Human Rights versus Power-Sharing by Christopher McCrudden (Queen’s University, Belfast & University of Michigan Law School) and Brendan O’Leary (Queen’s University, Belfast). The publisher’s description follows. Consociations are power-sharing arrangements, increasingly used to manage ethno-nationalist, ethno-linguistic, and ethno-religious conflicts. Current examples include Belgium, Bosnia, Northern Ireland, Burundi, and Iraq. Despite their growing popularity, they have begun to be challenged before human rights courts as being incompatible with human rights norms, particularly equality and non-discrimination. Courts and Consociations examines the use of power-sharing agreements, their legitimacy, and their compatibility with human rights law. Key questions include to what extent, if any, consociations conflict with the liberal individualist preferences of international human rights institutions, and to what extent consociational power-sharing may be justified to preserve peace and the integrity of political settlements. In three critical cases, the European Court of Human Rights has considered equality challenges to important consociational practices, twice in Belgium and then in Sejdic and Finci v Bosnia regarding the constitution established for Bosnia Herzegovina under the Dayton Agreement. The Court’s decision in Sejdic and Finci has significantly altered the approach it previously took to judicial review of consociational arrangements in Belgium. This book accounts for this change and assess its implications. The problematic aspects of the current state of law are demonstrated. Future negotiators in places riven by potential or actual bloody ethnic conflicts may now have less flexibility in reaching a workable settlement, which may unintentionally contribute to sustaining such conflicts and make it more likely that negotiators will consider excluding regional and international courts from reviewing these political settlements. Providing a clear, accessible introduction to both the political use of power-sharing settlements and the human rights law on the issue, this book is an invaluable guide to all academics, students, and professionals engaged with transitional justice, peace agreements, and contemporary human rights law.